409 Beacon is located on the south side of Beacon, between Gloucester and Hereford, with 407 Beacon to the east and 411 Beacon to the west. 409 Beacon was designed by Snell and Gregerson, architects, and built ca. 1867, one of five contiguous houses (401-403-405-407-409 Beacon). James Gregerson, whose firm designed the houses, lived at 403 Beacon. On May 30,1866, Robert Pratt sold the lot where 403 Beacon would be built to James Gregerson, whose firm would design 401-409 Beacon, and on September 18, 1866, he sold the lot where 405 Beacon would be built to artist William Morris Hunt. He retained the other three lots until after the houses were built. Click here for an index to the deeds for 409 Beacon. On April 24, 1868, 409 Beacon was purchased from Robert Pratt by his unmarried aunt, Mary Pratt. She purchased 401 Beacon on the same day. She lived at 85 Mt. Vernon and at Oakley in Watertown, and purchased 401 and 409 Beacon as investments. By 1874, 409 Beacon was the home of stock auctioneer and broker Francis Henshaw and his wife Sarah Willard (Nourse) Henshaw. They had lived at 37 West Cedar in 1873. Sarah Henshaw died in February of 1876. Francis Henshaw continued to live at 409 Beacon in 1878. In July of 1878 his unmarried sister, Annie Brooks Henshaw, purchased 407 Beacon, next door, and he and his children had moved there to live with her. 409 Beacon was not listed in the 1879 Blue Book. On September 25, 1879, 409 Beacon was acquired from Mary Pratt by banker and broker Matthew Bolles. He and his wife, Harriet C. (Shepard) Bolles made it their home. 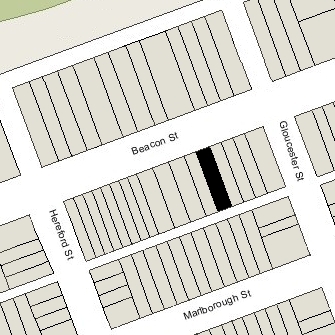 They previously had lived at 445 Shawmut. They also maintained a home in West Roxbury. Matthew Bolles died in March of 1898. Harriet Bolles continued to live at 409 Beacon until her death in September of 1900. During the 1900-1901 winter season, 409 Beacon was the home of Walter Motherwell Briggs and his wife, May Elizabeth (Phillips) Briggs. They previously had lived at 236 Commonwealth. Walter Briggs was a real estate dealer and stockbroker, and would later become treasurer of several mining companies. They had moved to Dedham by 1902. 409 Beacon was not listed in the 1902 Blue Book. On October 1, 1902, 409 Beacon was purchased from the estate of Matthew Bolles by Mary Cornelia (Hull) Fay, the wife of Harry Frank Fay. They previously had lived in the Longwood section of Brookline. They also maintained a home in Lexington. Harry Fay was a former cigar dealer and music teacher, who by 1900 had become president of several copper mining companies. 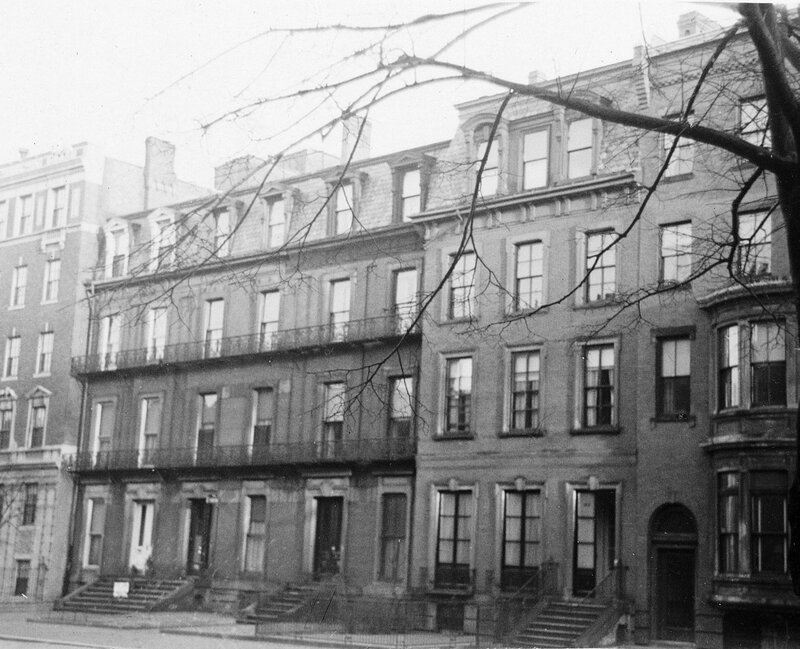 The Fays continued to live at 409 Beacon until about 1906, when they made Lexington their year-round home. The house was not listed in the 1908 and 1909 Blue Books. On May 29, 1909, 409 Beacon was acquired from Mary Fay by Charles Frederic Lyman. He and his wife, Isabella Ogden Reed (Macomber) Lyman, made it their home. They previously had lived at 161 Beacon. Charles Lyman and John Appleton Burnham, III, were partners in the firm of Lyman & Burnham, which manufactured automobiles ca. 1904-1905 and later dealt in automobile accessories. By 1910, Charles Lyman had become a stockbroker. 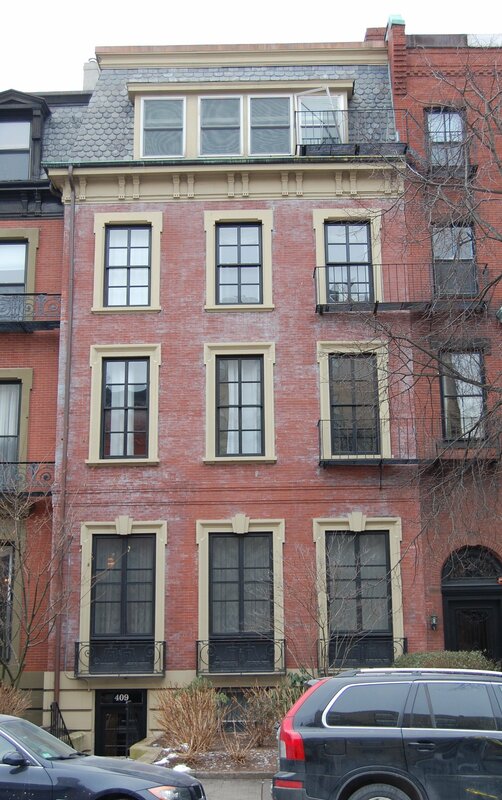 The Lymans continued to live at 409 Beacon in 1911, but had moved to 291 Marlborough by 1912. On June 16, 1911, 407 Beacon was acquired from C. Frederic Lyman by Miss Susan Thayer. She previously had lived at 1 Raleigh and in Lancaster with her mother, Susan (Spring) Thayer, the widow of Eugene Van Rensselaer Thayer. Susan (Spring) Thayer had died in March of 1911. Susan Thayer married in June of 1912 to architect Henry Forbes Bigelow, and they lived at 409 Beacon until about 1915. By 1916, they had moved to 142 Chestnut. 409 Beacon was not listed in the 1916 Blue Book. On March 31, 1916, 406 Beacon was acquired from Susan (Thayer) Bigelow by attorney William Endicott Dexter. He and his wife, Mary Fitzhugh (Lindsay) Dexter, made it their Boston home. They previously had lived at 291 Marlborough. They also maintained a home in Prides Crossing. Mary Dexter died in November of 1946, and W. Endicott Dexter moved soon thereafter. On February 10, 1947, 409 Beacon was acquired from William Endicott Dexter by Evelyn M. Kaufman of Brookline. In April of 1947, her brother, Sylvester Kaufman, a lawyer, applied for (and subsequently received) permission to convert the property from a single-family dwelling into six apartments. As part of the remodeling, the front entrance was moved to the eastern side of the building and lowered to street level, and the front dormers were removed and replaced with a four window dormer. The remodeling was designed by architectural engineer Mendal Waters. Plans for the remodeling are included in the City of Boston Blueprints Collection in the Boston Public Library’s Arts Department (reference BIN R-79). On May 26, 1947, 409 Beacon was acquired from Evelyn Kaufman by the Wentworth Construction Company, operated by Joseph Samuel Goodstein. On February 20, 1948, 409 Beacon was acquired from Wentworth Construction by Revenue Realty, Inc. Charles Goodstein, Joseph Goodstein’s brother, was president of Revenue Realty. On May 16, 1952, 409 Beacon was acquired from Revenue Realty by Nina M. Chiesa, a secretary. In 1954, she lived in one of the apartments at 409 Beacon. She previously had lived at 105 Pinckney. On February 23, 1954, 409 Beacon was acquired from Nina Chiesa by Joseph Goodstein’s son, Robert H. Goodstein, as trustee of the 409 Beacon Street Trust. In November of 1954, Joseph S. Goodstein filed an affidavit indicating that he had been “in charge of” the property for five years and that it had been a ten-unit apartment building throughout that time, and, accordingly, in December of 1954, Robert Goodstein filed for (and subsequently received) permission to increase the legal occupancy from six to ten apartments. 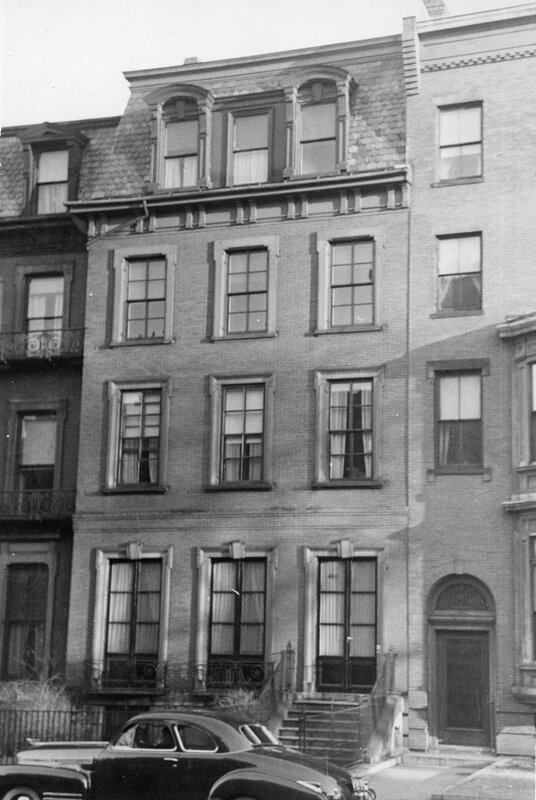 On December 17, 1954, 409 Beacon was acquired from the 409 Beacon Street Trust by Nathan Koffman. The property changed hands and on June 21, 1961, was acquired by Lenk Properties, Inc. On June 14, 1963, Lenk Properties transferred 409 Beacon to its president, Richard Van Siclen Lenk. A former flower grower (his family’s business, Belmont Gardens, raised gardenias), Richard Van S. Lenk was a real estate developer and investor. He died in March of 1994. On May 28, 2008, 409 Beacon was acquired from Richard Van S. Lenk’s estate by 409 Property Associates, LLC. On July 22, 2008, Beacon 409 Property Associates converted the property into ten condominium units, the 409 Beacon Street Condominium. In October of 2009, Units 9 and 10 were consolidated into one penthouse unit and the total number of condominiums reduced to nine.